Light arm circles forwards and backwards. Loosen up the hips by circling the hips in both directions. Loosen up the legs as well. Standard repetition count for these types of exercises usually fall within the 30 to 40 range, so shoot for roughly 30 to 40 repetitions in both directions. The object is simply to loosen the muscles and tendons and get the blood flowing. The best time to do the Zhan Zhuang exercise is in the morning as the sun comes up, but it is also fine to do it any time during the day. Five minutes at night before bed is also beneficial. There is an additional exercise called Ba Duan Jin 八段锦, or “Eight Section Brocade”, but I won’t discuss that in this post. I will reserve this exercise for a later posting, as it is an entire progression of postures and movements in itself. 2. Holding the Ball (or Balloon) – After Wu Ji, step the left foot out to shoulder width or a little bit beyond shoulder width apart. Sink the body into a light squat, keeping the back straight, and pelvis slightly tucked frontward. Raise the arms up together until they sit in front of the chest, palms facing the body, fingers gently spread apart. The posture should look like you are holding a large ball or balloon in front of your chest. In fact visualizing that you are holding a ball or balloon in your arms will help the exercise along by focusing the mind’s attention on the space between your arms. That is another key to this exercise; a lot of visualization comes into play. Breathe naturally. It will be challenging to hold this position for most of those who try it, but with time and determination, it will gradually become easier. Persisting through the discomforts that arise from standing is a major key in progressing forward. Initially, as you begin Zhan Zhuang, aim to stand for at least five minutes. Even five minutes of standing on a regular basis can be measurably beneficial. As time goes on, increase the standing time incrementally until you can stand for at least 20 minutes. Zhan Zhuang training goes beyond this one posture into other stances, with advanced versions of all, but for the purposes of this post, I am only discussing the main stances, “Wu Ji” and “Holding The Ball”. At the end of your standing session, slowly bring the hands down in front of you, and raise the body up to a full standing position, returning to Wu Ji. Stand in Wu Ji for an additional 1 to 2 minutes, and relax as much as possible. To finish, do some arm circles, and take a relaxing walk. Your legs will be tired, but this is all part of the training, so be sure to leave enough time between Zhan Zhuang and any other activities you have to fulfill during the day. The exercise should not be a strained endeavor. Relaxation is the key to performing Zhan Zhuang correctly. When your muscles are crying out for you to stop, try to gently will them to relax. It should not be forced. Zhan Zhuang is a gentle, yet demanding exercise. Zhan Zhuang is an exercise of relaxation while simultaneously building strength of the entire body, both inside and out. So if you add this training to your life, I hope that you enjoy it, and don’t stress about progressing too fast. Things will happen when the body is prepared for them to happen. That is the key to creating a truly healthy and strong body. Disclaimer: If you are a little more than out of shape, or have a special condition that might be aggravated by increased blood flow and muscle tension, like a heart condition and such, I would recommend seeking clearance form a doctor before attempting any demanding exercises of any sort. Hi, thanks for reading. I checked out your post that you were talking about. I’m glad to see that you’re into the Shaolin arts. My background is in Shaolin as well. I wish you all the best with your journey. I hope that you will stop by in the future, as I will be posting a lot more pertaining to health and the mind as regularly as I can. You have explained all aspects of these two postures/moves very well along with the practice. I have never heard of Zhan Zhuang before. Is it similar to Thi Chi or Yoga? I am really interested in anything to do with our energy, I am working mostly with the Chakras through Yoga and meditation at present, but I am fascinated with all practices. I’m glad to hear that you like the post and that you are interested in the practice. 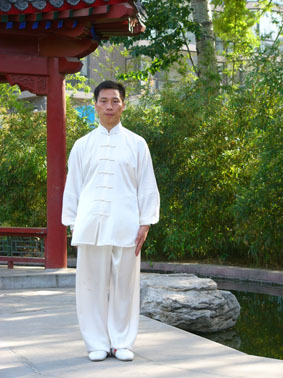 This type of Zhan Zhuan actually is the main standing exercise in Tai Chi, and if one was to use it as a supplement to Yoga, then they can do that also. It will do nothing but help in promoting the health of the body. Pity I’m not in Canada, otherwise I would have a physical place for you to go for in person instruction. If you have any more questions, please don’t hesitate to ask me. I will do my best to answer them for you. How is your Yoga and meditation practice going? Thanks for the reply. Yoga is good and I could always be meditating more (working on that one). I will come back and read your post on abdominal breathing, in sounds interesting. No Problem. Thank you for reading. If you ever have any questions or difficulties in your meditation, feel free to bring them up with me. I’d be happy to assist any way I can. It’s pretty much what I do every single day, so I know the challenges that it can present. I rec’d a phone message stating you would be charging my Visa $30.00 for a one year subscription to mind health news letter. I DO NOT wish to subscribe to the news letter. You stated to log on to this web site to unsubscribe, but I have been unable to locate anywhere on this site to unsubscribe, so I am hoping this message will suffice. PLEASE DO NOT sign me up for a new subscription. Thank you for your assistance in this matter!!! This blog has no Mind Health newsletter, so that’s why there is no place to unsubscribe. I don’t charge for anything on this blog at the moment, only donations are accepted. I’m not sure what website that newsletter is for, but it seems as though it incorrectly referred you to this blog. Sorry for the inconvenience. what a discipline of concentration and focus. form transcends practice. Paying attention with this intensity is awesome to see and hear. I’m glad you feel this way. I’m just trying to spread this around to as many people who are willing to listen as possible. You are bending your knees way to much. Just a slight unlock is needed. Thank you. There are multiple ways of performing the stance. Some bend slightly, some bend a little more, as long as the knees do not extend beyond the toes, then it is fine. Just as training in the horse stance has variations–deep squat to more shallow.